Make something special of tax day with a dinner out for two at Mazzio’s. You just have to purchase one dinner buffet and 2 soft drinks to receive another dinner buffet absolutely free! 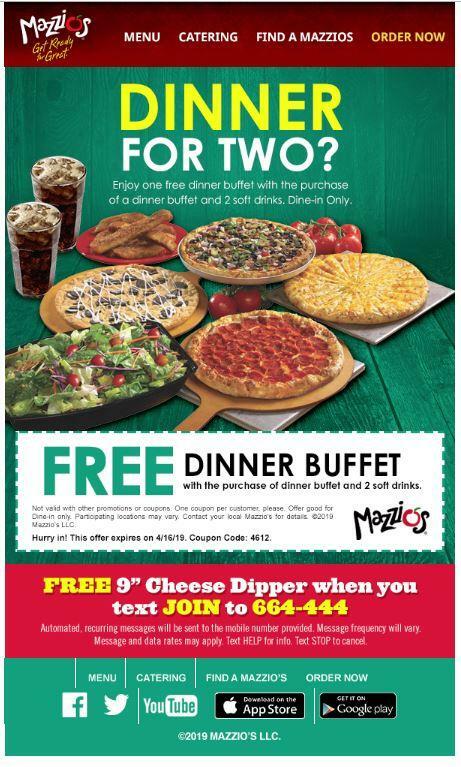 Call ahead to make sure that your Mazzio’s is participating in this promo. Go here to get a coupon to redeem an additional dinner buffet for free. Have a lovely dinner for two! * US only. Valid for dine-in only at participating stores. Limit of 1 coupon per customer. Ends 4/16/2019.